Despite my sudden release from the failures of my camping equipment and the reduction in weight caused by the 'burial ceremony', I now had a new set of problems. Without the tent, I knew that my budget would not extend to using guesthouses for the whole route and this, coupled with the knowledge that a bank holiday was looming meant that I was forced to re-evaluate my plans. 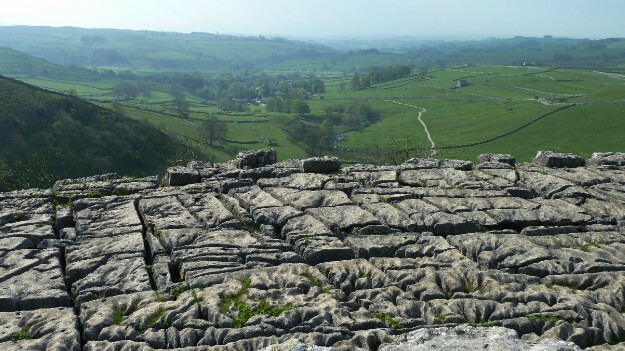 Many guesthouses in the UK are unwilling to take bookings of less than two nights at weekends and with the approaching weekend being a holiday weekend, this would mean that most, if not all in the Yorkshire Dales National Park would require bookings of three days minimum, and this was always assuming that they had a room free anyway. I knew that Bowes was around the halfway point so I decided that if I could get there before the bank holiday, I would end my trip there and return at a later date to complete the northern half of the walk. 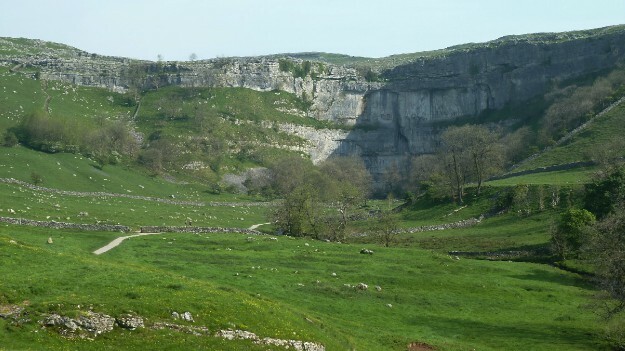 I turned these thoughts over in my mind as I walked out of Malham towards Malham Cove and decided that despite the disappointment of not finishing the walk, this was now probably the best option. The weather was still fine, the rain that had long been forecast still had not materialised and I began the steep climb up the path alongside the impressive limestone cliffs of the cove. 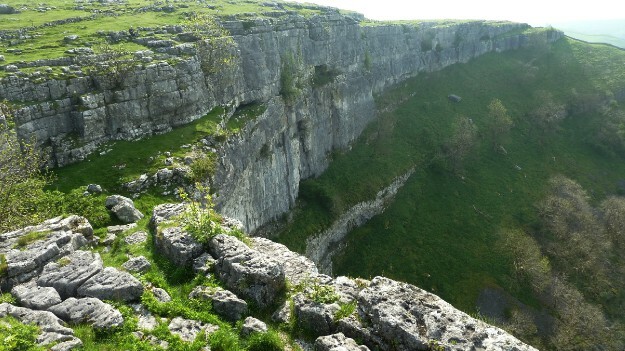 Once on top, I crossed the equally impressive limestone pavement as I made my way to the edge and peered over the dizzying drop to the path below. It was at this point that I became aware of a birdwatcher on the opposite side of the cove sitting with a tripod and a very long telephoto lens and as I stood loooking in his direction, I saw what I took to be a peregrine falcon plummet out of the sky in an incredibly fast dive before pulling up at the last minute and disappearing into a crevice in the cliffs. It was clear that the 'twitcher' was watching the falcons aerobatic displays but he seemed to be unhappy with my presence as I could feel him staring at me constantly while I took in the views from the top of the cove. Reminding myself that I had as much right as him to be there, I took plenty of photos before turning round and heading off along the narrow, rocky defile of Watlowes Valley. My guide book describe the day as ' a sensational day's walk' and so it proved. Soon, I was skirting around the attractive Malham Tarn before heading off on a long haul up to the summit of Fountain's Fell. 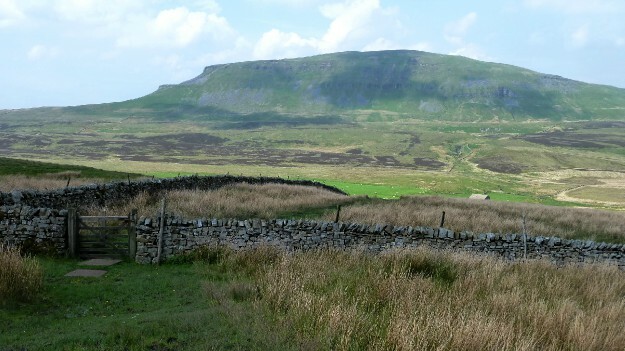 This, as the book suggested, was 'real' walking country and I had the whole place to myself for the climb to the summit, which I reached and then stopped to stare in admiration at the superb view of Pen-y-Ghent, one of the Yorkshire Three Peaks and the next objective on the walk. Unencumbered by the pack, I was making quick progress and as I descended, I passed two walkers, the first 'real' walkers I had seen all morning but I soon had the place to myself again. I knew this was set to change once I reached Pen-y-Ghent but for now I revelled in the solitude and the fantastic scenery. Leaving the road along valley floor, I headed off on a track towards the now imposing summit of Pen y Ghent, that now I was down on the floor of the valley, had taken on almost 'Himalayan' proportions. 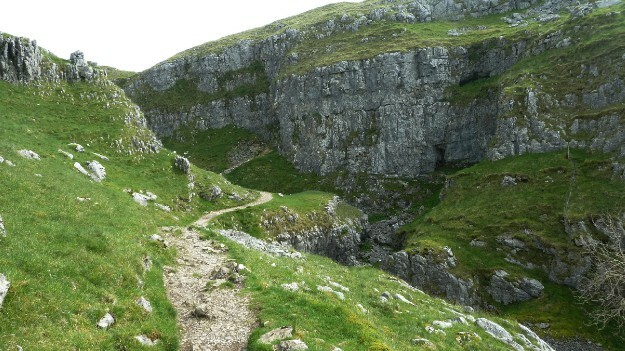 I decided I would have a break before the start of the climb to the summit at the point where an alternative path branched off to Horton in Ribblesdale, thereby avoiding the climb to the summit. 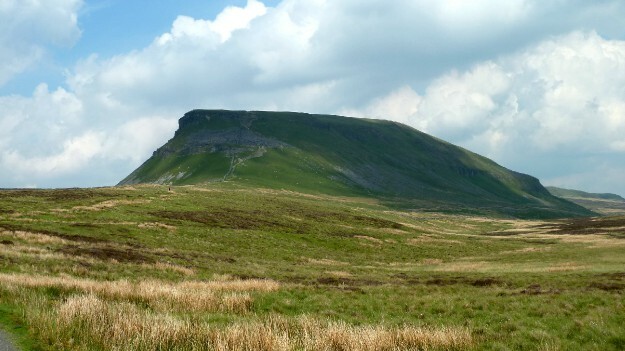 Much as the thought of arriving at my destination without the effort involved in the climb appealed, I had no intention of taking the easy option, despite having climbed Pen y Ghent before. As I sat in the shelter of a dry stone wall at the path junction for a breather, I smiled as I recalled that previous ascent many years before. Myself and a friend had driven from the south of England and started walking from Horton along this alternative path to start the climb to the summit. As it had been quite a long drive, we both had a sudden need to relieve ourselves but the countryside provided no cover so, after checking that there was no-one around, both took the advantage of the solitude and relieved ourselves by the side of the path. We were therefore a little embarrassed to discover as we climbed up to the path junction where I now sat that there was a group of people sheltering by the wall who judging by the grins on their faces as we approached had 'enjoyed' a grandstand view. Oh well, when you've got to go etc..... After a short break reminiscing, I shouldered my now lightweight pack and began to climb. Although steep, the climb did indeed take me 'only fifteen minutes of panting' as my guidebook suggested. Once on the summit, I enjoyed stunning views and had a short conversation with a walker enquiring about the virtues of walking with two poles. I gave him my thoughts on the subject and then jogged down the steep grassy path that ran parallel to the far more difficult looking rocky 'main path' using the poles to almost 'vault' down the hill. 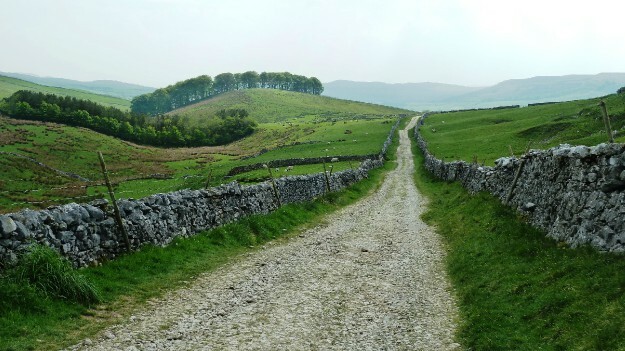 As the path levelled out somewhat, I slowed down and enjoyed a leisurely stroll into Horton in Ribblesdale. As I arrived at the road in the village and marvelled at my good fortune with the weather, I felt spots of rain fall on my head. Amazed at the coincidence, I looked up to see a large black cloud overhead and jogged through the village to my hotel just as the heavens opened. These were the first spots of rain that I had experienced on the walk so far and proved to be the last on the Pennine Way.